The interplay between logic and argumentation has a long history, from ancient Aristotle’s logic to very recent formal argumentation in AI. This is an interdisciplinary research field, involving researchers from, e.g., logic, philosophy, artificial intelligence, and law. 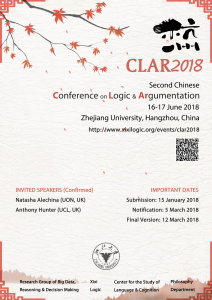 The goal of the CLAR 2018 conference is to highlight recent advances in the two fields of logic and argumentation, respectively, and to promote communication between researchers in logic and argumentation within and outside China. CLAR 2018 takes place at Zhejiang University in Hangzhou, China, 16-17 June 2018. Proceedings will be published in Logic in Asia (Springer, Studia Logica Library). What are the roles of logic and/or argumentation in social networks? How to model legal reasoning, medical reasoning, etc. in logic and/or argumentation? How can we formalize reasoning in game theoretic situations? What are the logical principles, models and patterns of daily life argumentation? What are the logical theories, methods and techniques that can be of interest to researchers in formal argumentation? How can existing logics be represented within existing argumentation frameworks? What are the trade-offs between expressive power and computational complexity in logic and argumentation? How can we model the strength of arguments? How can we further develop and apply formal argumentation in AI? How to identify and formalize argumentation in natural language texts? Accepted full papers will be published in a volume of Springer’s Logic in Asia series (Studia Logica Library). Accepted submissions of both types will be invited for presentation at the conference. Authors of accepted submissions will also be invited to submit extended versions to a special issue of Journal of Applied Logic, after the conference. Each submitted paper will be carefully peer-reviewed by a panel of PC members based on originality, significance, technical soundness, and clarity of exposition and relevance for the conference. For each accepted paper, at least one author is expected to register for and present the paper at the conference. If you have any question, please contact clar2018@126.com.